↑ "No Panaceas! Elinor Ostrom talks with Fran Korten". Shareable: Civic System. 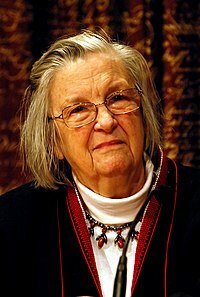 March 18, 2010. http://shareable.net/blog/no-panaceas-a-qa-with-elinor-ostrom. अन्तिम पहुँच तिथि: February 20, 2011. ↑ Leonard, Mike (6 December 2009). "Nobel winner Elinor Ostrom is a gregarious teacher who loves to solve problems". The Herald-Times (Bloomington, Indiana). Archived from the original on April 15, 2015. https://web.archive.org/web/20150415173651/http://ww.heraldtimesonline.com//stories/2009/12/06/news.qp-7916285.sto?code=d9341e1a-e395-11e4-a7e0-10604b9f2f2e. अन्तिम पहुँच तिथि: 15 April 2015. ↑ "Elinor Ostrom". The Telegraph (London). 13 June 2012. http://www.telegraph.co.uk/news/obituaries/9329881/Elinor-Ostrom.html. अन्तिम पहुँच तिथि: 15 April 2015. ↑ Wall, Derek (2014). The Sustainable Economics of Elinor Ostrom: Commons, Contestation and Craft. Routledge. ↑ Biographical Memoir of Elinor Ostrom (1933–2012). National Academy of Sciences. 2014. http://www.nasonline.org/publications/biographical-memoirs/memoir-pdfs/ostrom-elinor.pdf. अन्तिम पहुँच तिथि: 15 April 2015. "Governing the Commons: The Evolution of Institutions for Collective Action", published in Ukraine. The Workshop in Political Theory and Policy Analysis at Indiana University.